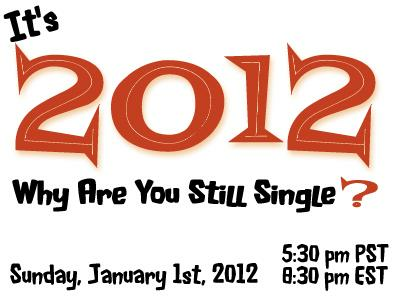 It is 2012 - Why Are You Still Single? It's the first day of a new year, 2012 to be exact. And you and your cronies Me Myself and I celebrated another New Year's eve together. With Valentine's Day coming up its time to get real with yourself and figure out why you're still single after all these years. Have you ever asked yourself why? Are you looking for unattainable perfection, or are you secretly happy about being single and have no desire to couple up? Let's talk about the possible 365 reasons you're still single though you claim you don't want to be. Call 347-327-9215 to participate in the live, on-air discussion.